Want to get a URL from your Instagram account? Maybe you want to get a URL from someone else’s Instagram account? …Or the URL of an individual post? 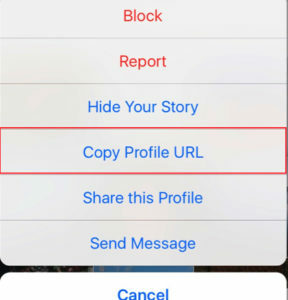 In this article, you’ll learn how to fetch the URL from your own or someone else’s Instagram profile or post. Note that you cannot fetch your own profile URL if you’re logged in to your account. To get your URL, you need to either log out of your account – or, use the trick presented in this article further on. 1. Go to the profile you wish to get the URL from. 2. Tap the icon in the top-right corner. Getting the URL from someone else’s post is equally simple as getting their profile URL. 1. Go to the post you wish to copy the URL of. Note that to get the URL from your own post (when logged in to your account), you need another method that will be presented below. 2. Tap the icon in the top right corner of the post. 1. Go to the post you wish to fetch the URL from. 2. Tap the icon in the top right corner. Getting the URL from your own or someone else’s Instagram page is super easy. 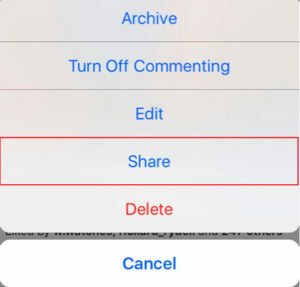 In fact, it is so easy to remember that you could write it almost anywhere, for example in text messages – without having to copy and paste it. If you prefer to copy and paste the link, you can do so as well. If you wish to get the URL from particular posts, you can do so as well. Go to the post you wish to take the URL from. Copy the URL that appears in the bar.